Universal life insurance policy combines long-term insurance protection with tax-sheltered savings opportunities. It provides for considerable control and flexibility by allowing the Owner to choose and change the amount of insurance coverage, the premiums to be deposited, the premium payment period and the investment options. The Transit Account is a holding account where deposits can be temporarily invested when the Yearly Maximum Premium has been reached in a year, or when the Fund Value has been increased to the point where the policy is no longer tax-exempt. Transferring excess amounts to the Transit Account. Sending excess amounts directly to the Owner. Shelter Optimizer Option, selected by the Owner, allows the Sum Insured of Perspecta coverage to be adjusted to take full advantage of the tax exemption room available to life insurance policies. Available for Single, Joint First-to-Die, Joint Last-to-Die (excluding Perspecta Paid-Up on First Death) and Multiple Life contracts. Increases will stop once a maximum Sum Insured is reached. You can choose a life pay plan, meaning you will make monthly premiums for as long as you live or go with a 20 years pay plan. Some people prefer to go with a 20 years pay plan, simply because they don't want to worry about making an extra monthly payment once they have retired. There is piece of mind in knowing that the insurance is there to stay, fully paid up and the beneficiary will receive a tax-free benefit upon the insured's death. Guaranteed cash value can be used by the insured to borrow against if a need for extra funds arises at any time. Borrowed funds can either be paid back or they will be deducted from the death benefit paid to the beneficiary. Monthly premium $91.35 for 20 years. This relatively new product in Canada is a tax-free LIVING BENEFIT. Changes in our lifestyles have caused us to suffer more critical illnesses, while breakthroughs in medical science have enabled more people to SURVIVE. Compare these statistics: in 1900 life expectancy was 42 years for a male and 46 years for a female, in 1998 it was 77 years for a male and 82 years for a female. People are living longer because modern medicine can save the patient but may cause a huge financial drain on family resources. Traditional insurance products often fall short of this dilemma. The Canadian Cancer Society estimates that 67% of costs related to cancer treatment come from indirect expenses not covered by Provincial health plans. Your physical health & your financial health. If you knew that you would be diagnosed with cancer in six months, would you buy this insurance? Physical health + Financial health = TOTAL WELL BEING!!! Disability insurance is available to everyone up to the age of 65, but should especially be considered by self-employed individuals. These individuals range from physicians, lawyers, accountants and executives to teachers, office clerks and bookkeepers. A disability claim can be based on either having a loss of income or an inability to perform the important duties of the occupation. Because disability insurance is acquired to replace lost income, it is important that the after-tax benefits received are sufficient to meet the specific need. THE BENEFITS ARE RECEIVED TAX-FREE. Please note that if you have disability benefits at work and the premiums are paid by your employer, the benefits become TAXABLE in your hands. It is sometimes a good idea to review your disability plan and add your private coverage to cover the shortfall. For a professional male, non-smoker, 30 years old, with annual income of $75,000.00 monthly premium of $72.20 will provide a monthly tax-free benefit of $3,500.00 or if you are just adding to the plan you already have at work a monthly premium of $43.40 will provide a tax-free benefit of $2,000.00 in the event of disability. 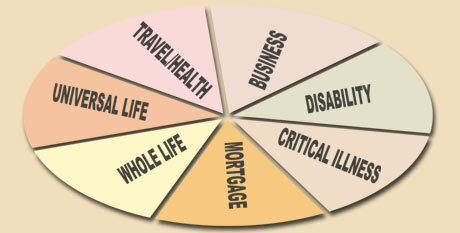 Canada Life offers many disability programs to suit each situation. Also, non-cancelable and Guaranteed Renewable program is available to age 65. No matter what happens, as long as the premiums are paid, Canada Life cannot refuse to renew, alter the schedule of premiums, cancel or change the benefits of the policy unless requested by the insured. A wide variety of plans are available to business owners. Whether it's corporate liability, a key person or a group plan you are looking for. I will be more than happy to discuss your needs and find the plan that best suits your particular situation and your budget. Wide variety of Health Coverage plans available for families & individuals including prescription drugs, dental, vision care, ambulance, nursing care, etc. Actual terms & conditions are detailed in each policy contract accordingly. Premiums are based on the age and the type of coverage. Let me help you select the best package tailored to your specific needs. Also, travel insurance is available on daily, monthly or annual basis. Starting from as little as a $1.00 per day. Having visitors from another country? Don't take a chance. Enroll them in a visitor's insurance plan to avoid any unexpected surprises. Did you know that one day in a hospital can cost you anywhere from $500.00 to $1,500.00? If I have a mortgage, I need mortgage insurance, don't I? If you 're preparing to buy a house or reviewing your current financial plan, this question is likely to be one of many. The information below outlines your options. If anything happens to you, the death benefit will be payable only to your mortgage company, not your family. Your coverage will decrease steadily over time. You can only have the coverage amount you specified rather than one you choose after analyzing your needs. You can't convert your term insurance to a permanent product in the event your health changes. The renewal rates aren't guaranteed. If you decide to deal with a different financial institution, your life insurance coverage will cease. It decreases as you pay your mortgage off. It is non-convertible, since insuring you for life and securing the mortgage loan have nothing to do with one another. Would you be interested in a product (hat was this rigid and customer-unfriendly? Not likely, but you should know that all of the above conditions are true with most bank mortgage insurance.